When it is a question of Google maps viewing, sometimes they mention the mood "map/terrain" in which the rugged countries (land) are put in changing of the color tones. In such maps mood the plains and mountain chains with marked level altitudes are clearly imaged on the map. But if you want to determine the altitude in some place or the altitude above sea-level in the valley by the drawing on the map it is very difficult to do it. That's why let's use the auxiliary program for Google maps. This program determines both geographical coordinates (longitude and latitude) and altitude above sea-level. You can transfer the map in the mood 'terrain', and then find the peak you need and determine its altitude. You can determine not only the altitude of the mountain tops and peaks with the aid of this online program. If you have not interested before in what altitude above sea-level was the country where you lived in the results of your measurement on the map would surprise you. The program Google Earth can determine the country altitude above sea-level like as the Google map does it. The altitude determination is made dynamically in this program for coordinates under the mouse pointer. Information. One can determine the country altitude above sea-level with the aid of the aneroid barometer. It will show 760 mmHg on the zero altitude at the temperature of 150 C. On the altitude of 500 meters above sea-level the barometer will show 720 mmHg, on the altitude of 1000 meters it will show 670 mmHg and so on. When the altitude above sea-level raises the atmospheric pressure reduces about 8 mmHg for every 100 meters' raising. The bigger altitude the smaller atmospheric pressure and the smaller oxygen concentration in the air is. For example, the atmospheric pressure on the altitude of 3500 m is in tone and a half times less (1,5) than on the zero altitude and so the oxygen saturation of the air is less too. The height of 800 meters is detrimental to health of some people. That's why it's necessary to pay attention to the altitude of the country when one plans his travelling by the satellite map. On the other hand, there are a lot of hight-mountain health resorts which are situated more than 1500 meters above sea-level. 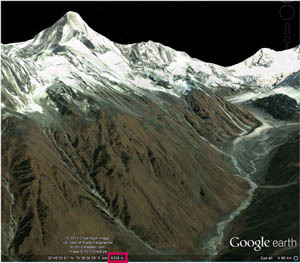 In the Google Earth picture the present information about the altitude above sea-level is indicated on the screen. The program options, the block 3D View/Units of Measurement has the choice of units of measurement: meters/kilometers or feet/miles. Of course, one can determine the altitude with the aid of the aneroid barometer, GPS navigator, or it is possible to use both this device and another one at the same time. You can use simultaneously two devices in one as for example one can use Smartphone Samsung Galaxy Nexus into which both GPS navigator and barometer are put. But one can do such measurement of the altitude or GPS coordinates directly on the measuring locality and have these devices at one's disposal. It is its defect. But when you are going to travel or you want to measure the altitude only to broaden your outlook then it is better to use Google Earth or Google map. After all, to determine the altitude of any place it that will be enough to click only the point you have found on the satellite map. The next reason in favor of measurement by the satellite map is that there is no need in independent determination and computation of geographical coordinates and altitude above sea-level with the aid of barometer, tables or formulas. The result given by the satellite map is quite sufficient for a person who doesn't need of exact metrological measurements. But if it is necessary for you to concretely determine the altitude above sea-level where the office, the flat or the roof of the house is situated then you have to do your independent measurement. You can determine the altitude above sea-level of any place on the Earth by the satellite map, but you cannot determine the height of buildings and other edifices. Even if you choose the concrete building, you will receive only the information about the country altitude above sea-level. Another information. If the point on the planet is found but there is no information about its altitude above sea-level in the Google service then the programme will compute the average altitude of four nearest coordinates with determined altitude above sea level. You have to pay attention to the fact that one can determine the depth of oceans and seas with the aid of such service. In this instance the measured altitude will be shown with the negative values that is to say that the depth is determined.